Michael Hartnett was an esteemed poet from a young age, but his assurance about his creative destiny had its dangers. In the following edited essay, first published in The Irish Times on February 16th, 2009, MICHAEL SMITH recalls a significant artist whose early death at 58 on the 13th of October, 1999 can be viewed as an accident of time and place. The author, Michael Smith himself, poet and Aosdána member, passed away in November 2014. His contribution to the arts as a teacher, poet, editor, translator and publisher cannot be overstated. He had a profound impact on the Irish literary scene. He has been described as a classical modernist, a poet of modern life. Born in Dublin in 1942, Michael Smith was the founder of New Writers’ Press in 1967 and had been responsible for the publication of over 100 books and magazines. He was keen to promote the modernist tradition in Irish poetry, publishing the work of Thomas MacGreevy, Brian Coffey, Denis Devlin, Anthony Cronin, and Michael Hartnett, among others. As with many relationships, even the most intimate, it is often extremely difficult to pinpoint the original meeting. I can only say that it was in the early stage of our enrolment in UCD that I first met Michael Hartnett. I cannot recall the circumstances of that first meeting. I can’t even remember what academic subjects Michael had chosen. What I do remember is that James Liddy (and perhaps John Jordan) had agreed to pay his first year’s fees. So the lad from Newcastle West in Co Limerick was indeed going to receive some patronage. This patronage was bestowed purely on the strength of his poetry. Michael was recognised as a gifted poet from a relatively early age, and quite rightly so. Michael almost never attended a lecture, so far as I recall. I was little better myself. The whole novelty of being university students was more than enough for both of us. Study was for others. Unlike Michael, I was deeply rooted in my Dublin working-class background, whereas, for Michael, Dublin was a kind of playground, despite his Limerick working-class background. But that working-class background was something we shared. I think Michael had no other ambition than to be a poet. I think he gave little thought to how he would survive financially in the future. Was he feckless in this regard? Probably. Did he come to Dublin with the naivety of Kavanagh, expecting wonderful things? I doubt it. He didn’t have that innocence. On the other hand, he wasn’t cynical. John Jordan and James Liddy had accepted him as a gifted poet. The future was in the lap of the Muse. What memories I have of him are selective, like all memories, I suppose. Often we would walk home together after a drinking session in McDaid’s, where we were usually treated to drinks by James Liddy and his friend, Patrick Clancy. Patrick Kavanagh was still holding vociferous court there at the time. Michael had already had his first confrontation with Kavanagh in the Bailey at the launch of the first issue of Poetry Ireland, edited by John Jordan and published by the Dolmen Press. That confrontation is too notorious to need detailed repetition. 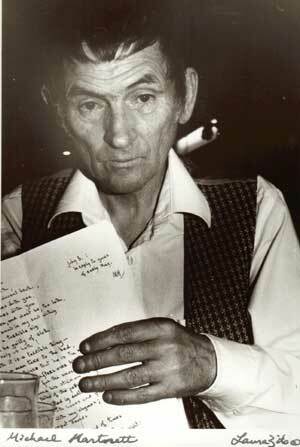 Michael made an adverse comment on Kavanagh’s poem (to Kavanagh himself, although Michael didn’t know who he was) that begins: “I am here in a garage in Monaghan.” Kavanagh’s reaction was violent, upturning a table full of drinks. Michael was living in digs in a cul-de-sac off the North Strand, so our walk home often overlapped. I recall him voicing his strong disapproval of Kavanagh’s raucous behaviour in McDaid’s, saying that if anyone in Newcastle West behaved like that, he would be barred from the pub, and why should a poet be made an exception of. He had great admiration for Yeats, though, oddly, not so much as a poet but as a businessman. He admired Yeats’s business acumen. In his digs, under the bed, Michael had a small brown cardboard suitcase which he opened for me once to show me a huge quantity of beautifully scripted poems. I sometimes wonder what happened to all of this material. There were, of course, other young poets in UCD at the time: Paul Durcan, Macdara Woods, Brian Lynch, Eamon Grennan, Malachy Higgins, to mention just a few names that come to mind. In the case of the first three, and including myself, James Liddy was undoubtedly the extraordinarily generous mentor, with John Jordan a reserved encourager. Of all of us, it was Michael who was held in the highest esteem by both John and James. And that esteem was well-deserved, for Michael arrived in Dublin as an already accomplished poet who was not looking for, nor needing any, teachers in the art of poetry. Much has been made of Lorca’s influence on Michael, largely because of his later version of Lorca’s Romancero Gitano, but really it has more to do with the precocity of the early work of both poets. But thereof come in the end, despondency and madness. I knew, and indeed Michael knew, that there was no money in poetry (Kavanagh had learnt that years before) and that he would have to earn his living at some stage in the future – but he seemed unconcerned by this. Writing poetry was a lifetime’s work, regardless. I sometimes think that a lot of Michael’s problems of later years came from that dedication. Yes, he did later earn his living in the international telephone exchange on Andrews Street, but he found it boring and was only too glad to escape from it (even during working hours) and head for O’Neill’s of Suffolk Street to drink pints with some other of his escapee colleagues from the exchange. And Michael was good company, a wonderful raconteur, witty, and possessing a fund of knowledge of all sorts of arcane subjects. He had an extraordinary memory. Yet always it was as the poet that he was treated, in whatever company he found himself. That was the identity he had chosen or had been chosen for him. I think he never abandoned that. And therein lay a danger, the same sort of danger that beset Dylan Thomas, for one cannot always be a poet. There has to be a life apart from being a poet, at least for poets without personal financial resources or the resources of a generous benefactor. Ezra Pound had his wife’s money behind him, and also financial support from his doting father. Neither Michael nor Dylan Thomas had anything of the sort. For Thomas there was the horrible scrounging and, later, the equally horrible American readings. For Michael, after his stint in the exchange, there was very little, and he seemed to live a hand-to-mouth existence, even when later he returned to Newcastle West with his wife, Rosemary, and their two children. Later, a cnuas from Aosdána came in useful, and some prizes he won and some royalties he managed to squeeze out of publishers. 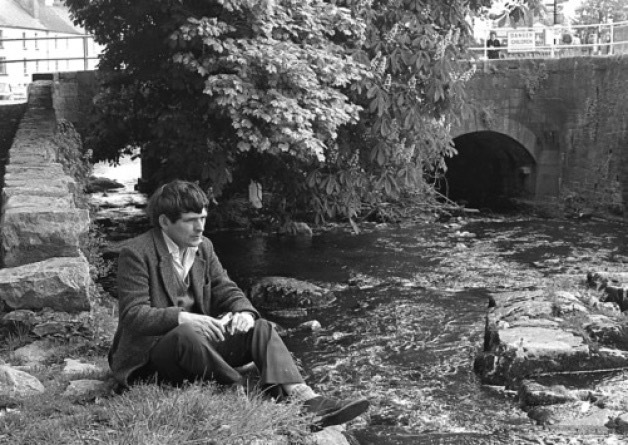 To attempt to be a professional poet in Ireland in the late 1960s and early 1970s was a recipe for trouble. The days of the literary salons, such as Æ’s, were well and truly over. That left the pub, which unfortunately became Michael’s court, where he met his admirers who provided him with the kind companionship he needed, treating him to drinks and accepting him as a poet. Was there anything else he might have done, any alternative? There was not at the time any such thing in Ireland as a poet in residence. So Michael made do with what was available. A poet is not like a novelist who must toil daily and for long hours if he or she is to be productive. For the poet, the Muse is fickle and her visits are not on demand. So the poet must wait, never sure what the future holds for his work. When his own lyrical gift began to fail (though not until he had written some of the best poems written by an Irish poet in his time), Michael turned to translations from the Irish, translation always being a good means of keeping one’s skills honed. Why did Michael turn to writing his own poetry in Irish? I think that this, too, was part of his attempt to be accepted socially as a professional poet. After all, in the old Gaelic order there had been such an acceptance. That order, however, was long gone and could never be recovered. After his early-evening court sessions in Doheny and Nesbitt’s, his admirers (often cultivated and literary civil servants) would head off to their respectable homes in the suburbs, leaving Michael as an abandoned court jester (which, in due course, he was becoming). Let it be said that there was no malice in this among those who patronised Michael with drink and small loans of money. But they had families at home and a job to do the next day. Michael’s early death, whatever the medical causes, can be viewed as an accident of time and place. In a sense, he was a martyr to poetry. Gifted, even a genius, but nonetheless a martyr. If only . . . It’s useless now to ponder such possibilities.